I learned recently that my apartment may be featured in an online remodeling blog which boasts a huge readership. Needless to say, I am very excited. But what comes with that is a push to get absolutely every project one has ever dreamed of done in a matter of two weeks. Hence, the radio silence recently. As of five days ago, my girls' room was yellow and their headboards an oak color. I have to say that they were beautiful the way they were. But I had a vision for the room and so decided to follow it. The brown you see on the floral detail is intentional, partially left over from the original color and partially achieved by sanding and a brown glaze. I am happy with the outcome but I am sure that I will work more on them after the photo shoot. I love the detail and wonder how an artisan achieves this in woodcarving. I wanted it to have a chalky look. But to also feel old and worn, which, at almost 100 years old, it certainly is. It is tough to see in photos but I used a dirt glaze, which I rubbed into the ornamentation to give it depth and warmth. I actually really like that the swag is broken in the middle. I think it implies authenticity. I am having rails made at the moment. 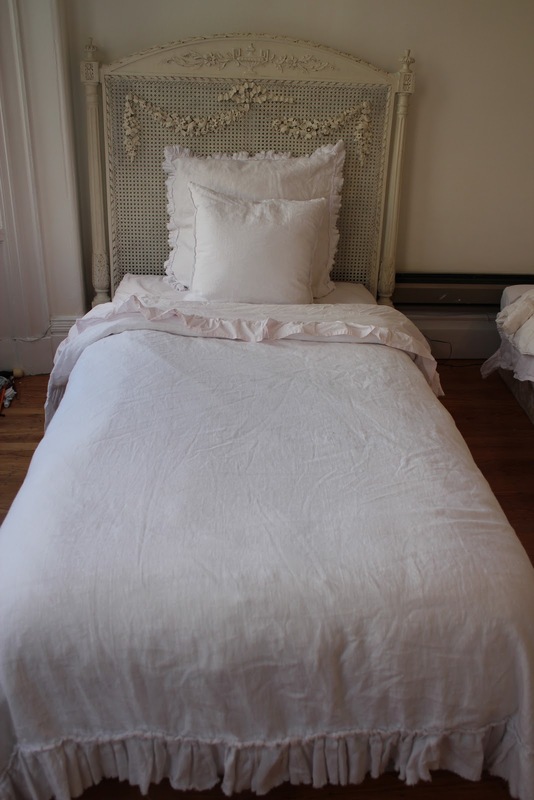 After they are completed, the bed will be raised off the ground and have a matching footboard. 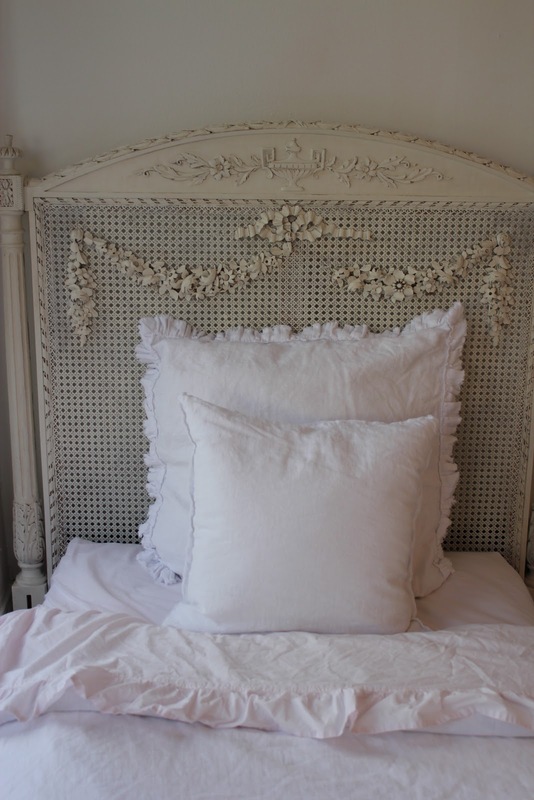 I absolutely love the Louis XVI style of these caned headboards. The girls and I found this chalkboard at our local antiques fair/flea market. It is made from antique ceiling tins. 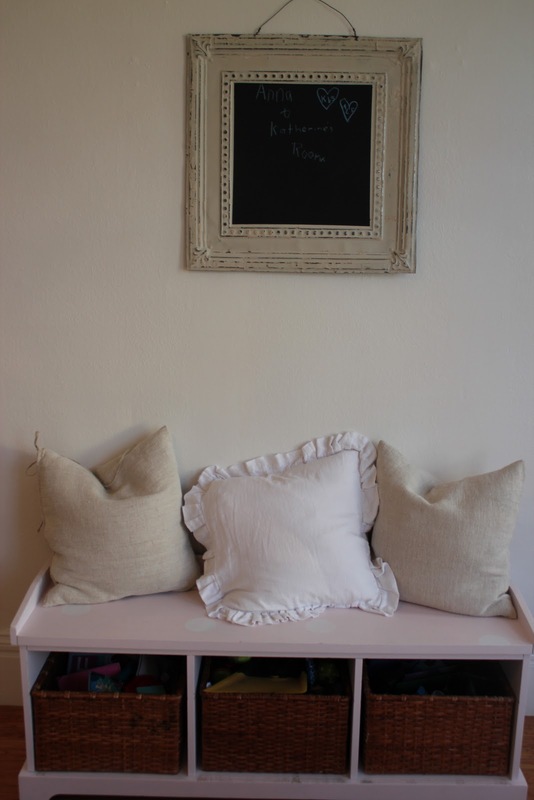 This bench is a hand me down from a friend of mine. It was black, which doesn't really fit in our apartment at the moment, so I painted it pale pink. If you look closely you can see that I added some white polka dots. And last but not least, the obligatory tidy up reminder. Hope you all have a great weekend. I'll post more next week after I finish. I am planning to make moss covered letters, in the form of their monograms, to hang above the beds. PS the pillows are available in my Etsy store. Oh that is so exciting...I hope you will share when you are featured so we can see it. 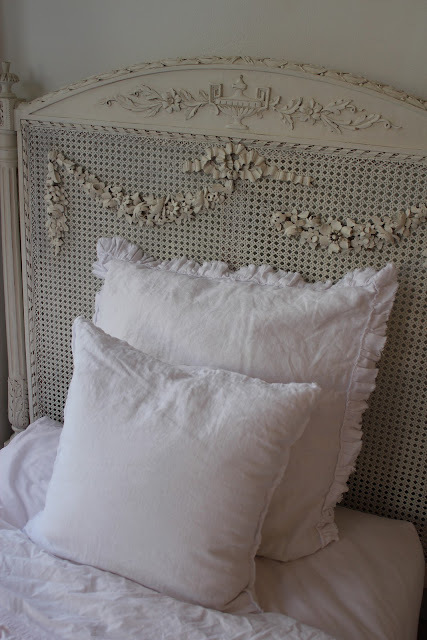 I absolutely love love love these headboards. So so beautiful. I always dreamed of living in a studio apt in San Francisco like yours. I grew up in Livermore and as soon as I turned 16 would drive there as often as I could to walk the city and art galleries daydreaming and then go dance in the clubs at night. When I began college at SDSU as an Art major I had intentions of transfering to SFSU but my Mom would not let me. Your daughters names are beautiful. BTW...as cute as the toy cubby is in pink, I think black would have looked lovely too. Black matches the chalkboard and 'put away your toys' sign. So funny, I was on your site admiring your table and the pic of your darling husband. Thank you for the kind words. I do love our old SF apt. I actually say out loud almost daily, " I can't believe I get to live here." Very dorky but very true. I do miss having a garden though. We can't have it all, can we? I hope you have a lovely thanksgiving. 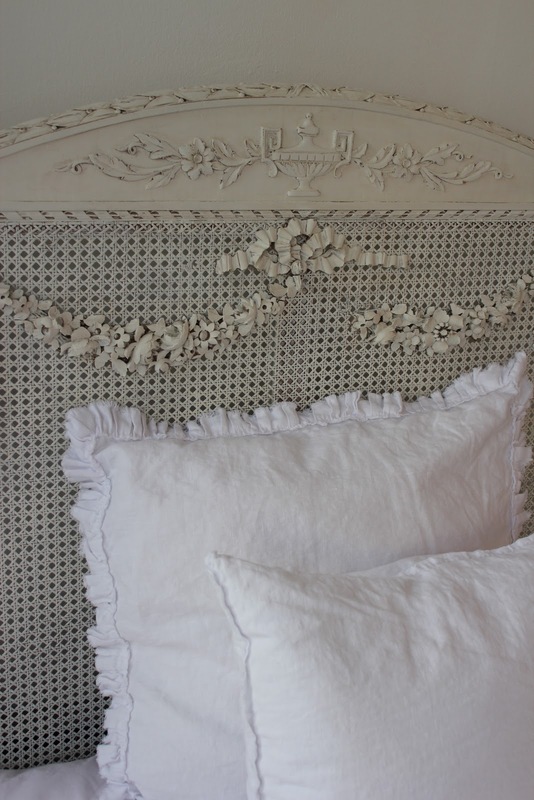 I LOVE the headboards! They look great! You are right about the missing swag piece, it adds so much. Congrats on your apartment getting featured...how exciting! Thank-you too for your sweet comment on my blog about my garden, it made my day! Just came across your blog and love your decorating style! 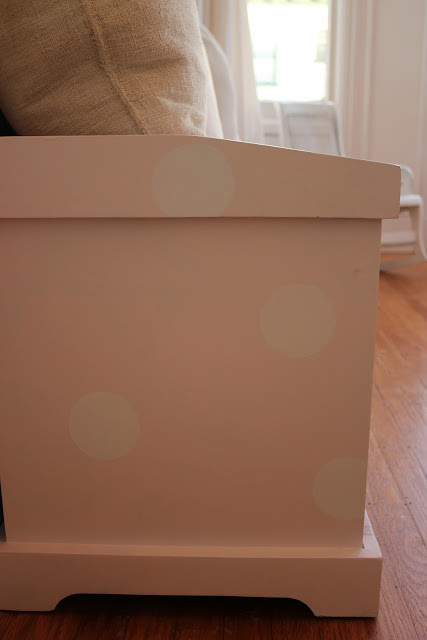 How exciting that your home will be featured and the girls room looks so sweet. Oh my gosh, Michele - this headboard is just plain delicious! It looks soooo very French vintage, I can't stand it! :) Congrats on the feature, too! I can just imagine you doing the happy dance over there....! lol! I love your girls room makeover...that broken swag is charming and it does lend authenticity. The bed turned out amazingly beautiful!!! You did a fantastic job! That bed is to die for!! 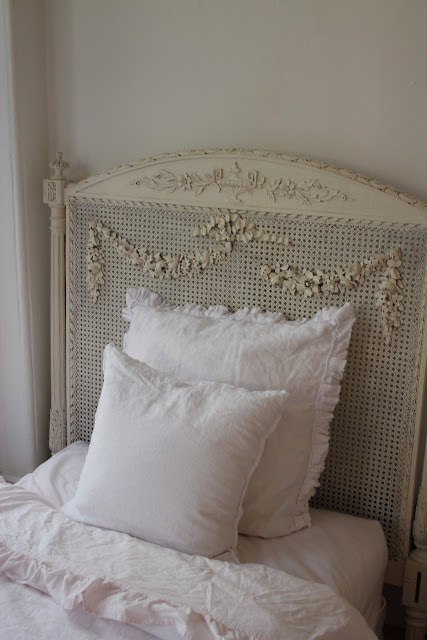 Beautiful~ love the gorgeous ornamentation on the bed-so pretty!! Congratulations on your feature! Those I'm a new follower. Those beds are lovely. 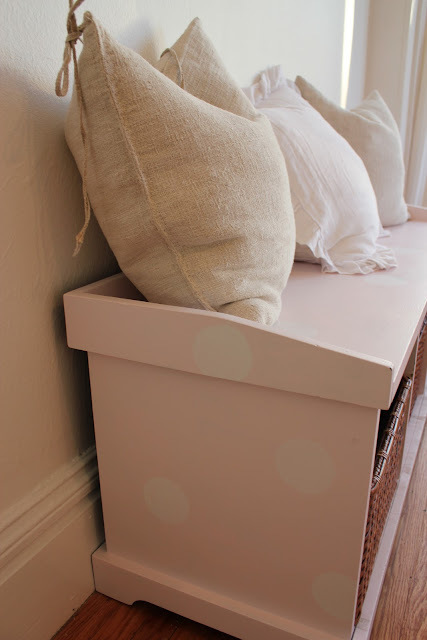 I love the polka dot bench, the pick up your toys sign and the beautiful pillows. I'm a new follower!